The first bread was probably baked on flat stones placed over an open fire. There is evidence to show that this method of cooking is very ancient, but grinding grain to make flour is one of the indicators of a Neolithic culture. Baking bread started about 4500 BC. The baking stone is easy to use. A large slab of flat stone is places on the embers of a mature open fire and left to become very hot. Flour is mixed with water, milk or alcohol to form a dough. A loose dough will make flat thin bread when poured and a stiff dough will produce thicker bread. The dough is placed on the hot stone to bake, the thicker bread needs turning half way through the bake. This type of unleavened bread needs to be eaten fresh as it has poor keeping qualities. You would only bake as much as you needed for a meal. By the roman period, this technology had developed into an Iron griddle plate suspended on a metal strap over a fire. This improved technology was in use well into the Victorian era. With the introduction of the hob, the griddle became a cast iron pan with a handle. 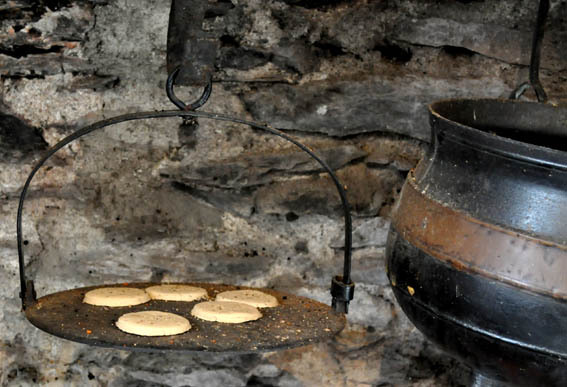 This is still in use today for baking welsh cakes and flat breads like farls. 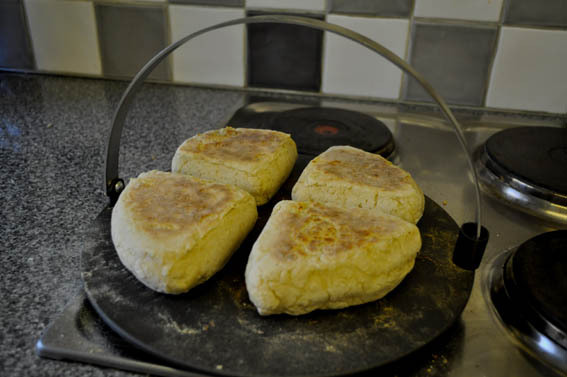 Kitchen Craft produce a baking stone of cast iron which will sit equally well on an Aga, an electric hob ring or a gas hob ring. This product is not usually stocked at outlet stores and may have to be ordered. Silverwood produce an anodised steel griddle plate which can be used on a cooker hob or over an open fire.